It would be hard to find people that never gazed upon the wonder that is cartoons, the morning/afternoon routine of watching those shows being one of the greatest parts of our childhood years. It’s no surprise that some of the cartoon characters are ingrained into our memory forever, whether with fondness or sheer hatred and while the majority of them were created purely with the power of the creators’ imagination, a select few were actually inspired by real people! Scroll down below to see who inspired some of the most iconic characters in cartoon shows and don’t forget to comment and vote for your favorites! 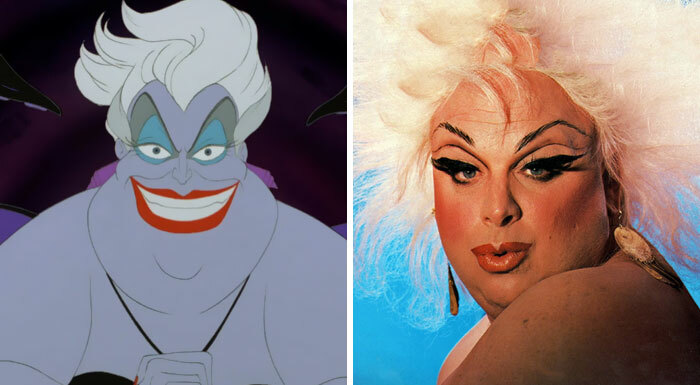 The Little Mermaid’s tentacled villain, Ursula the Sea Witch, was inspired by actor Harris Glenn Milstead’ drag persona Divine. Divine appeared in a number of John Waters’ movies which form a huge part of LGBT history and culture. 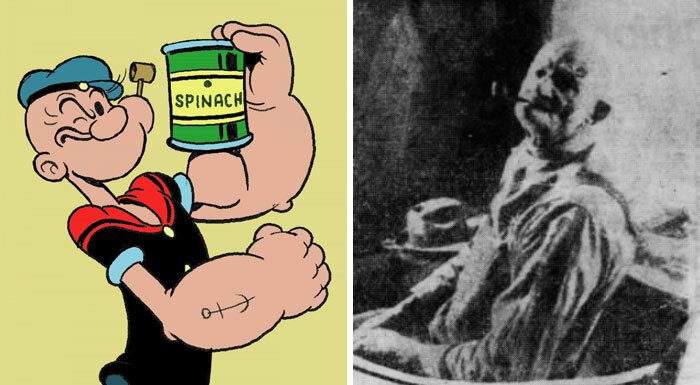 The spinach-munching-fist-fighting-sailor from our childhood is no doubt an iconic character. The inspiration for this strongman has reportedly come from a Chester, Illinois (the creator’s hometown) local, Frank “Rocky” Fiegel, a small and wiry, but tough guy. Fiegel smoked a pipe, was toothless and participated in many fights, just like the character. It is said that he’d been kind to children, although died childless and was buried in a lot that’s marked by an engraving of the iconic character on the headstone. 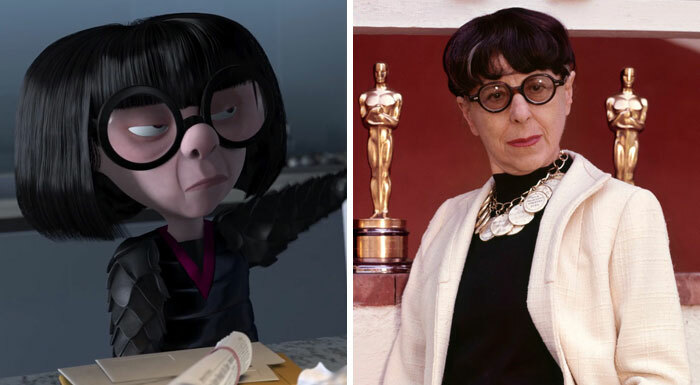 In The Incredibles, Edna is an eccentric fashion designer who creates costumes for famous superheroes. So it’s small wonder that people attribute this character’s likeness to Edith Head, a costume designer with signature style. With round glasses and the back bob cut, we sure can see the resemblence. The creators of The Jungle Book aimed high when they decided to get The Beatles to voice the vultures, however the offer was quickly shot down when John Lennon declined. This didn’t stop the animators from making the characters look like John Lennon, Paul McCartney, George Harrison and Ringo Starr. Not only do the vultures reemble the iconic band members, they also share Liverpudlian accents with them. Most of us are definitely familiar with the near-sighted, gullible and socially-awkward Milhouse Van Houten from The Simpsons. 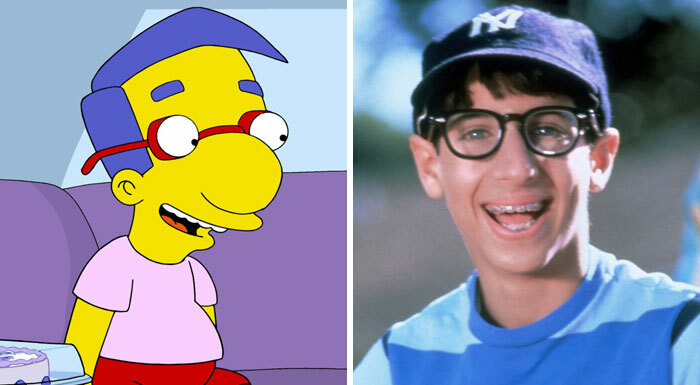 Although he was named after US President Nixon (whose middle name was Milhous), the boy’s character and likeness was based on Josh Saviano’s Paul Pfeiffer, whom the show creators aimed to caricature. We can certainly see how these two are alike. Another iconic character from “back in the day”, Betty Boop was originally created as a caricature of Helen Kane, an American singer who gained fame by imitating the style of black singer Baby Esther Jones. 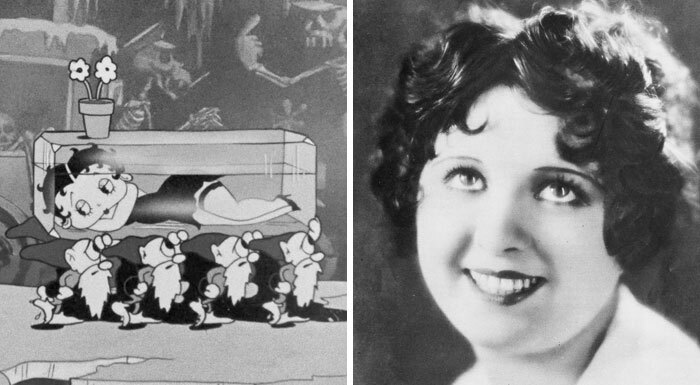 Although Betty was originally an anthropomorphic French poodle, as she became the star of her own cartoons, Boop was transformed into a full human. Kane ended up suing Max Fleischer & Paramount for exploiting her personality and likeness, but ultimately lost the lawsuit. Most of The Simpsons characters are etched into our memories forever and the greedy Mr. Burns is no exception. 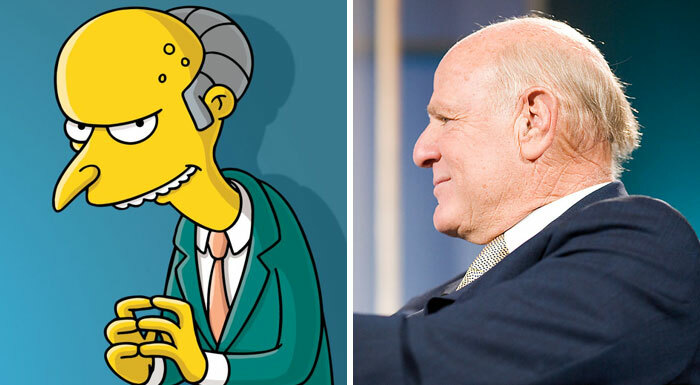 While the man himself is an embodiment of corporate greed, his appearance is based on Fox founder Barry Diller. We’re not sure if basing one of your antagonistic characters on your boss is a good idea, but with Mr. Burns it surely made a memorable result. Another character from a childhood classic, Mr. Magoo is the short, wealthy retiree who manages to alway get into all sorts of trouble due to his extreme shortshightedness and refusal to admit the problem. Luckily for the old fellow, he manages to get out of every problem unscathed. 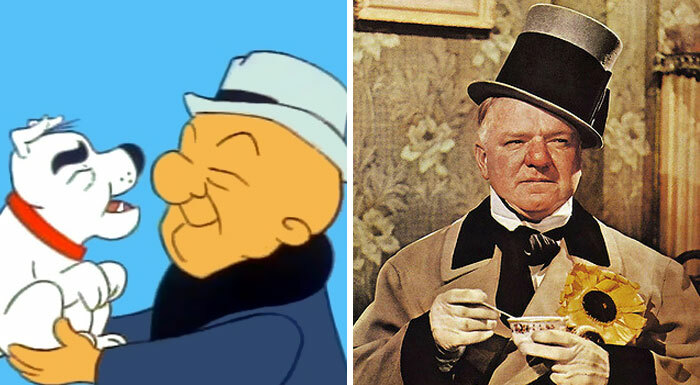 According to the animation director John Hubley, Mr. Magoo was a mixture of two people, his uncle Harry Woodruff and American comedian W. C. Fields. Looking at the photographs of Fields, it’s hard to deny the similrity! 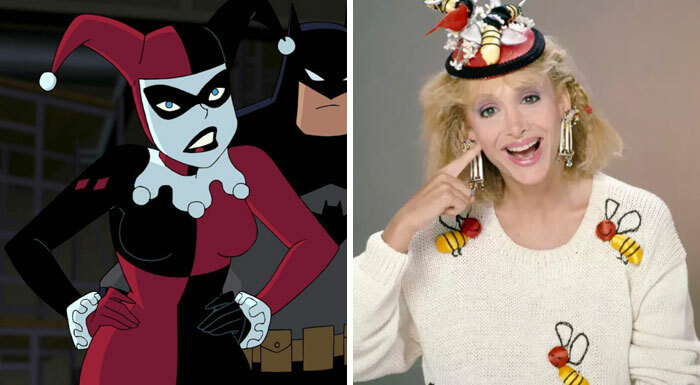 Perhaps it is a lesser known fact, considering Harley Quinn is such an energetic and “crazy” character that she surely seems to be a product of someone’ wild imagination, but Dr. Harleen Frances Quinzel was actually inspired (and voiced!) by a real-life person. Sorkin explained how the character’s creator, Paul Dini, first conceptualized the Joker’s sidekick. “Actually, Paul and I have been friends since college-back at Emerson. He was home one day watching Days of Our Lives [a soap on which Sorkin appeared]. We did a dream sequence where I was a court jester and he said that was the inspiration for Harley. Paul called me up and said, ‘Would you like to do this character?’ I said yes and came over! I was born to play her.” Sorkin said. 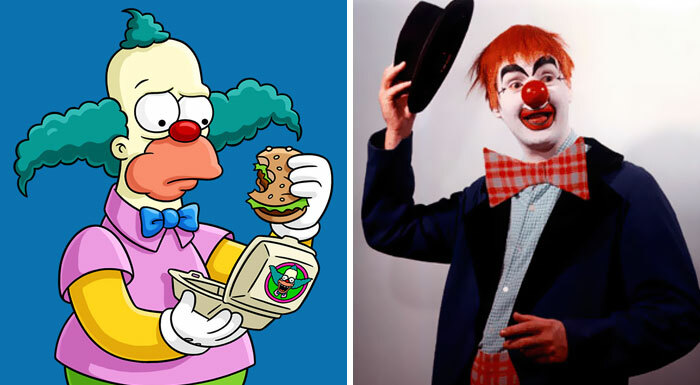 Herschel Shmoikel Pinchas Yerucham Krustofsky is better known to us as Krusty the Clown, the cynical, burnt-out, addiction-riddled smoking clown. To create this character cartoonist and show-creator Matt Groening was partially-inspired by a real-life clown Rusty Nails whom Groening watched as a child while growing up. 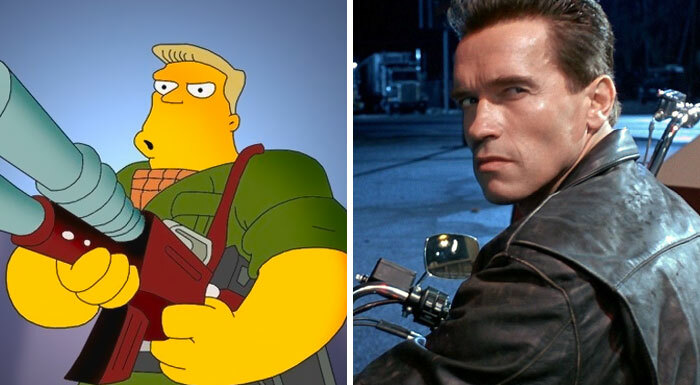 Wolfcastle is an Austrian, muscular actor that sometimes appears on The Simpsons show to represent the action movie star trope. And if “Austrian”, “muscular actor” and “action movie star” made you think of Arnold Schwarzenegger, then you have the right idea about who inspired Wolfcastle’s character. The show creators couldn’t make it more obvious that Rainier Wolfcastle is a parody of Arnold Schwarzenegger, right? In The Little Mermaid, Ariel’s character is based on the title character of Hans Christian Andersen’s “The Little Mermaid” story, with many changes in her personality. 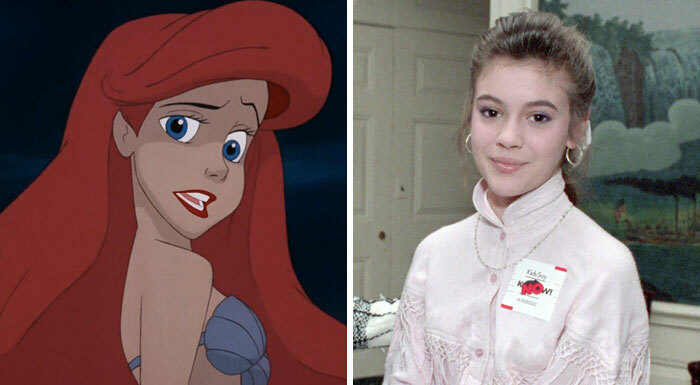 However, Ariel’s appearance was based on a few people, including the animator’s wife, model Sherri Stoner, who provided live-action references, but mostly it was none other than Alyssa Milano who was 16 at the time. Milano perfectly fit the “sweet” and “youthful” look the creators were looking for. She was also asked to host ‘The Making of “The Little Mermaid”, where they revealed to her that she was the inspiration. The sweet, innocent and warm Leopold “Butters” Stotch is definitely a contrast to the show’s main character Eric, but just as the latter, his creation was inspired by another person (although in Eric’s case it was a fictional character) as well. 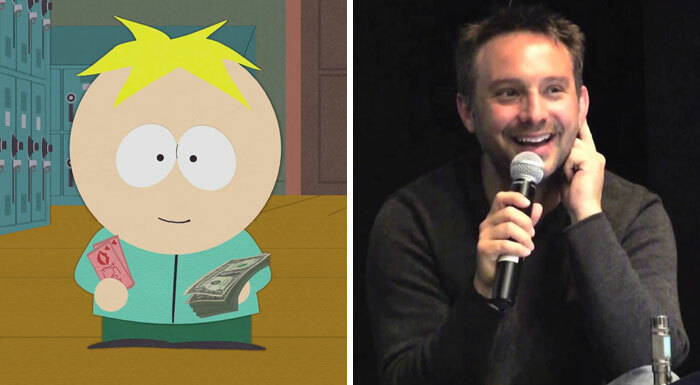 Butters is loosely based on one of the animation directors/producers, Eric Stough. The adorable red-haired, yet easily-scared toddler from Rugrats is, surprisingly, based on an adult person. 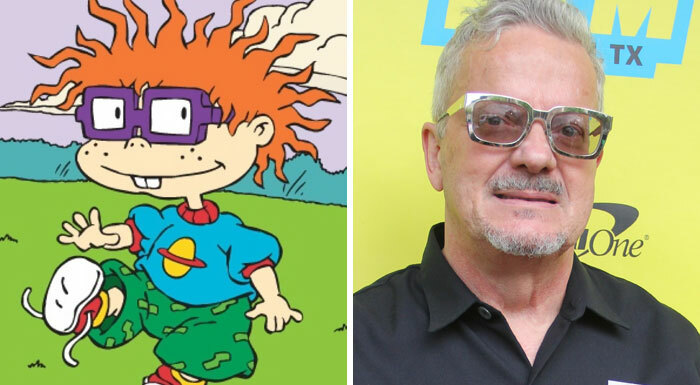 Chuckie’s character design features wild hair and the classic thick-rimmed glasses that we are sure were borrowed from Mothersbaugh. 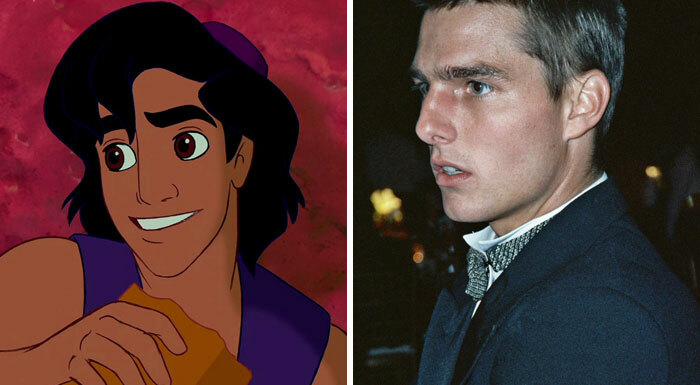 The protagonist of Disney’s Aladdin is a young, clever man who seeks to win the affection of princess Jasmine. The animators wanted to capture the youthful spirit and used Tom Cruise as the inspiration after ditching the original idea to base the character on Back to the Future’s Michael J. Fox, as it was decided that the design was too boyish and wasn’t “appealing enough”.